When it comes to hiking, we tend to overlook our legs. Our feet, sure—we spend lots of time and money to figure out what brand and style of hiking shoe or boot will best support and protect us on the trail—and our second consideration is usually reserved for high-quality base layer shirts or the hat that will provide us with just the right balance of shade and style, but the legs—oh, the poor legs! They’re usually the last (and yet one of the most essential) body parts we think about sheltering from the elements, and it only takes one icy trip on the trail to school you on the subsequent consequences. So help us help you do your legs a favor, and read up on how selecting the best winter hiking pants will give you a leg up on fully enjoying your wintertime outings. Shopping for warm weather hiking pants is pretty much a (balmy summer) breeze: you know you want lightweight material, breathability, UPF and bug protection, and probably some way to convert the pants into shorts. But what about winter hiking pants? Do they still need to be well ventilated? Provide UPF protection? Contain tiny internal space heaters? Who the heck knows?! Well, we do, which is why we’ve compiled a short and sweet must-have list to consider when searching for your next pair of winter hiking pants. Yes, yes—you’ve been wearing pants all your life, surely you know what to look for in fit! And that’s true…sort of. Because what you want when it comes to great fit in a pair of jeans is not necessarily what you want when it comes to great fit in a pair of winter hiking pants. Like jeans, hiking pants should be somewhat form fitting, but—unlike jeans—they should not restrict your movement in any way. On the other end of the spectrum, they shouldn’t be too baggy, as they’ll just drag you down and create a lot of unnecessary friction. Look for pants with articulated knees and gusseted crotches as well as material that has a bit of spandex for stretch and give. Also, if you’re trying your pants on in-store, be sure to do a little crouch-and-jump test in the dressing room. Sure, you might feel silly, but it’s better to freak out your dressing room neighbors than to invest your hard-earned dollars in a pair of pants that can’t support your range of motion. No, you won’t be caught in a warm spring rain, but yes, you will likely come into contact with snow and ice, which will turn right to water when it comes into contact with you. Look for pants that are waterproof and have a DWR coating as insurance, keeping in mind that a good nylon blend will ensure your pants take repelling water seriously. Depending on your personal comfort level, you may also want to consider pants that are windproof, giving you an even greater advantage when it comes to heat retention. This might seem silly, but it’s solid science: darker colors will absorb light (and therefore heat) from the sun, providing you with an extra source of warmth and a potential drying source if trudging through the snow has left you somewhat damp. It’s also worth mentioning here that color can be a safety measure on the trail, whether your traveling solo or with a group. Bright colors can make it easy to spot a member of your pack who might have wandered off course in the bright white landscape, ensuring that you’ll be able to pick them out, even from a distance. And if you’re venturing out alone and get turned around, those who come to look for you will have a greater chance in spotting you if your apparel stands out from the bleak landscape. No one likes to think of getting lost in the wilderness—especially in winter, when darkness sets in early and the temperatures can become dangerous for long stretches at a time—but it’s a responsible hiker who takes all things into consideration before setting foot on the trail. With all this talk of heat retention, it may seem counterintuitive to want air to escape from your hiking pants, but that’s pretty much exactly what you want. A breathable fabric and well-ventilated construction will keep you warm but not sweaty, and ensure that you’re not left with the unpleasant sensation of damp fabric clinging to your legs. Some preferred features that seasoned hikers demand of their cold weather hiking pants include an adjustable elastic waistband for optimal fit, plentiful zippered pockets for safely stashing personal effects, fabric with a solid UPF rating (hey, winter sun is still sun), and fitted cuffs to keep out any errant snow or moisture. You might also want to consider looking for a pair of winter hiking pants that provide extra coverage along the lower back, ensuring that—even if you fall or bend or stretch—you won’t be exposing any skin to the whipping winds of winter. Now that you know what to look for, let’s get to looking! Specific features: The Columbia Bugaboo Omni-Heat Insulated Snow Pant offers full, seam-sealed water resistance, an adjustable waist, zippered pockets, an adjustable internal leg gaiter, lower leg snap gusset, reinforced leg hem, and an active fit. 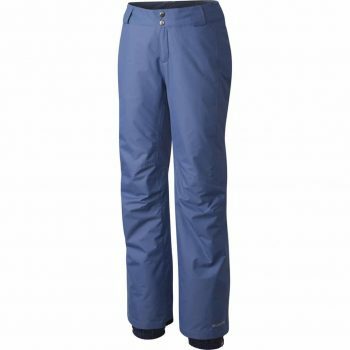 Best use: These durable, insulated snow pants are a perfect choice for cold, wet hikes and winter activities such as skiing or snowboarding. When it comes to covering all the basics and then some, the Columbia Bugaboo Omni-Heat Insulated Snow Pant is your huckleberry and then some. Columbia’s unique Omni-Tech, seam-sealed fabric provides an impenetrable barrier against wind and water, and their Omni-Heat technology pairs with the Microtemp XF II insulation to retain warmth while still being breathable to release inner moisture. An internal leg gaiter offers an extra layer of protection against the cold along with lower leg snap gussets, and the adjustable waist ensures you’ll always have a perfect fit. Despite having multiple lines of defense against the elements, these pants are remarkably lightweight and ready to adjust to your every move, with zippered pockets to keep all your items securely in place. Users report that the Bugaboo Omni-Heat Insulated Snow Pants tend to run small, so take care in determining your size if you aren’t able to try them on in-store. Related: The Columbia Men’s Snow Gun Pant gives you 60 g of synthetic insulation wrapped in a waterproof outer shell to keep you warm and dry on wet winter days. Specific features: The waterproof, insulated Columbia Polar Eclipse Pant is constructed of 100 per cent machine washable nylon, and features a snap closure with secure hand pockets. Best use: These cold weather pants are the perfect companion for a day on the slopes as well as the trail. If you’re looking for a basic pair of cold weather hiking pants to take to the trail this winter, the Columbia Polar Eclipse Insulated Snow Pants are a great choice. The 100 per cent Hydra Cloth 3000 nylon outer shell makes these stylish pants completely waterproof, and the chamois touch tricot 100 per cent polyester lining provides the wearer with comfortable protection from the cold, bolstered by the 100 per cent polyester 60 g Microtemp XF II insulation. A secure zip and snap closure ensures that even if you have some unfortunate slippage on the trail, your pants will stay right where they’re supposed to. Deep hand pockets also provide a safe home for keys and other personal items, and—best of all—these pants are fully machine washable and dryable, making it easy to keep them clean, fresh, and ready to tackle whatever cold weather adventures come your way. Users report that these winter hiking pants tend to have an unpredictable fit, so it’s best to try these on in-store if at all possible. Related: The Columbia Women’s Arctic Air Omni-Tech Pants are designed to keep you shredding in style, keeping snow and moisture out while keeping warmth and comfort in. Specific features: The Women’s Veloca Vixen Insulated Pant boasts breathable, fully seam-sealed Omni-Tech waterproof construction, as well as Omni-Heat reflective thermal insulation, leg venting, adjustable waist tabs, zippered pockets, bottom leg sippers, and an internal leg gaiter. 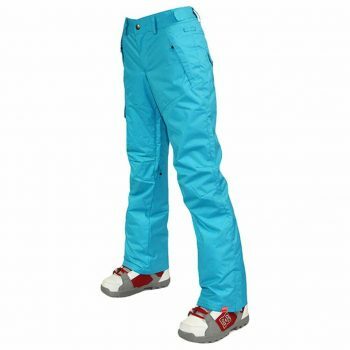 Best use: These heavy duty cold weather pants are designed to keep you dry for the duration of any high-octane winter activity from skiing to sledding to climbing. The Columbia Women’s Veloca Vixen Insulated Pant will stay step-in-step with you as you navigate the icy winter trail, giving you ultimate mobility with articulated knees, vented legs, and adjustable waist tabs for a fit guaranteed to move right along with you. The Omni-Tech membrane is fully waterproof yet breathable, constructed of durable polyester with fully taped seams. The Omni-Heat reflective lining and insulation—along with internal leg gaiters—will keep you toasty warm and focused on the trail ahead instead of the dropping temperatures around you. And even if you find yourself wiped out in a snow bank or two, the Back-Up adjustable high-back waist will ensure that the snow stays out and your warmth (although perhaps not your pride) stays put. Zippered hand pockets provide secure, convenient storage, and a zippered thigh pocket gives you that extra space that always seems to come in handy during a day of adventuring. Specific features: These pants offer 4-way comfort stretch fabric, zippered pockets, leg venting, hammerhead reinforced cuff guards, Omni-Heat reflective thermal insulation, fully seam-sealed Omni-Tech waterproof construction, adjustable leg openings, and an active fit. Best use: The Columbia Women’s Jump Off Pant is best suited for any snow day activity, such as snowshoeing, skiing, or treks in the great white wilderness. These high-tech, thoughtfully designed cold weather hiking pants have everything you could possible ask for in a piece of winter adventuring gear. 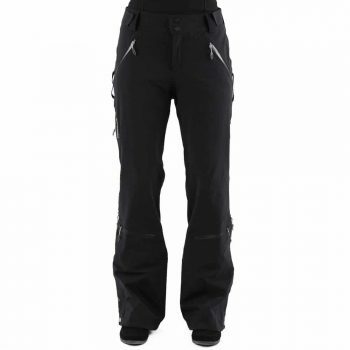 The Columbia Women’s Jump Off Pant features a waterproof and breathable Omni-Tech seam-sealed outer layer constructed of 4-way, 2-layer Cyberstretch (87 per cent nylon, 13 per cent Elastane), and an Omni-Heat chamois touch tricot insulated lining that reduces heat loss while still maintaining ventilation. The adjustable waist and adjustable leg openings give you total control over fit and a secure barrier between your legs and the biting winter air. These high-quality pants have waterproof zippers galore, from the zippered hand pockets to the bottom leg zips. The Columbia Women’s Jump Off Pant offers an active fit, which is tailored closer to the body to keep you streamlined and snappy, and smart lower leg pockets provide diminutive yet durable storage for small items. These pants are machine wash and dry friendly. Specific features: These high-performing winter weather pants are waterproof, anti-static, windproof, and have a breathable index rating of 8000. 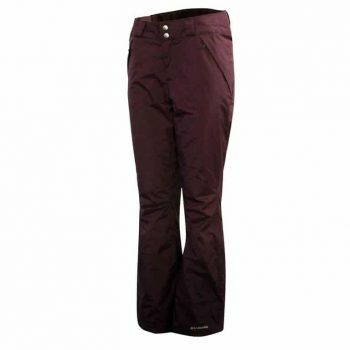 Best use: As the name suggests, the APTRO Women’s High Windproof Waterproof Pants are the perfect pants for a day on the slopes. The APTRO Women’s High Windproof Waterproof Pants have winter weather wear down to a science: the waterproof outer layer utilizes high-performance waterproof fabric technology that combines breathability with sturdy seamless construction. The coated fabric enables these pants to be entirely anti-static, thanks to the hydrophobic surface fibers that still allow fiber surface ionization. These pants are also windproof, keeping that cutting winter wind at bay no matter how fast you—or it—is moving. With a waterproof index of 10,000 and a breathable index of 8,000, you don’t have to fear a single snowflake or raindrop in these pants, and no matter how hard you go on the trail, you can be certain you’ll have optimal ventilation to keep the dreaded sweaty legs at bay. These pants are available in cheerful bright colors, which can be an asset on a winter trail where the landscape is a comprised almost entirely of shades of grey; you’ll never be out of sight to the other members of your party (but you’ll be sure to stay warm even if you get a little off track). Related: The APTRO Women’s High Windproof Technology Colorful Printed Ski Jacket is waterproof, windproof, breathable, and a perfect companion to the APTRO snowboarding pants when you want to tackle the slopes for hours on end. 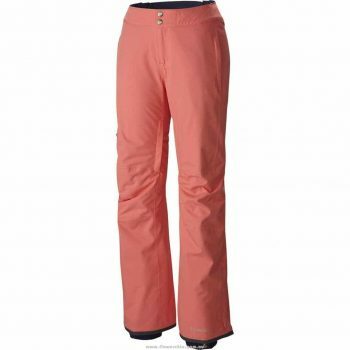 Specific features: The Insulated Fleece-Lined Ski Pants have a soft-shell exterior, micro-fleece lining, 6-pocket configuration, adjustable elastic waist, and zip fly with snap closure. Best use: These weatherproof pants are a sturdy go-to choice for cold weather adventuring on the trail. The soft-shell exterior of the Insulated Fleece-Lined Ski Pants keep out wind, rain, and snow while keeping your skin well-ventilated and retaining heat. This high-performing material also resists wrinkles and stays quiet even when you’re moving at top speed; after all, who can really enjoy the tranquil winter wonderland with the constant swish-swishing of snow pants? A micro-fleece lining will keep you cozy and warm while providing ultimate moisture-wicking action, and a zip-fly with snap closure provides a secure fit while you’re in motion. These pants were designed with convenience in mind, offering no less than six pockets for your personal items: two zippered hand pockets, and two side and two back pockets with Velcro closures. The adjustable elastic waist and belt loops give the wearer a customized fit, and the reinforced cuffs ensure that your pants will stay intact no matter what the trail (or your ski boots) have in store. As a hiker, you keep a thorough mental checklist of your needs before you hit the trail on any given day, and in the extreme temperatures of winter or summer, that list expands to ensure your safety and comfort against all the many hurdles Mother Nature might throw your way. Winter weather can obviously pose a threat if you’re caught unaware in damp clothes when dropping temperatures are afoot, so it’s essential to choose a cold weather wardrobe that’s equipped to keep you dry, comfortable, and moving confidently on your way. We’ve provided you with some fabulous options when it comes to choosing cold weather hiking pants; do you have any to add? Or have you put some of the ones we’ve suggested to use on the trail? How did it go? Give us your input in the comments!